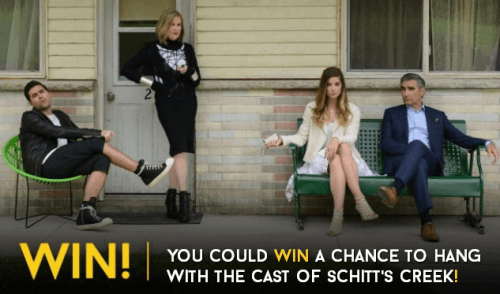 CBC Canada has a great contest on right now for fans of the new series, Schitt’s Creek. Enter CBC’s newest contest and you could win a chance to hang out with the cast of Schitt’s Creek! The new series, starring Eugene Levy and Catherine O’Hara follows a ruined video store magnate’s family who has lost everything and are forced to rebuild their lives in a small community they own. If you’ve ever wanted to visit Schitt’s Creek, now’s your chance. The winner of this contest will win a return trip to Toronto, 3 night’s hotel accommodation, 1/2 a day on the set of Schitt’s Creek, a meet and greet with the cast, an autographed script, $500 spending money, plus $15 from Eugene Levy’s pocket. To enter this contest, just visit CBC’s website and enter your name and email, it’s that simple! This contest ends March 5, 2015. There is a limit of one contest entry per person per day. This contest is available only to residents of Canada over the age of majority. Click here to enter CBC’s contest for you chance to meet the cast of Schitt’s Creek. Schitt’s Creek is my favourite comedy program! I love the humour and look forward to watching it each week. I love David YAY!! So funny!! !